The Tunnel under the Atlantic, by Maurice Benayoun is an interesting stimulatory system that connects visitors of the Pompidou Centre in Paris to the visitors of the Museum of Contemporary Art in Montreal through a simulated “digging” through skewed virtual medium. 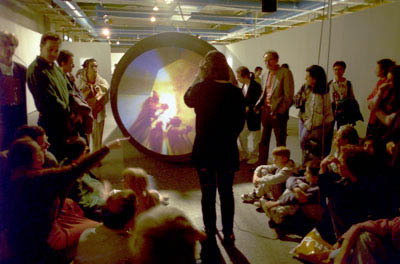 By using televirtuality, people in each museum can dig to meet each other, and then interact with each other in this virtual channel. They are brought together through communication as they survey their virtual surroundings that reveal geological strata as iconographic strata, bringing both shape and recognizable textures. This televirtuality was made possible by Tristan Lorach, who created the so-called “3D Digging Engine,” which allowed the user to "dig" anywhere they wanted within the 3D space. As the video (below) shows, this 3D virtual space is very similar to that of MineCraft: as you dig down through the virtual blocks under the surface of the world, slowly creating caves and paths that become part of a larger system. 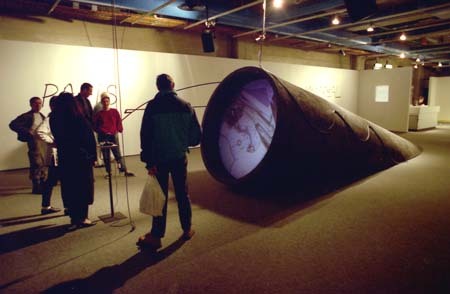 This type of art, connecting two groups of people from two separate locations through a virtual mean reminded me of Kit Galloway and Sherrie Rabinowicz's HOLE-IN-SPACE (1980) an artwork that connected people in public spaces in Los Angeles and New York City via satellite. People who happened to walk by the large window display-sized screen in a busy shopping center in Los Angeles could instantaneously talk and communicate with people in New York City. Today, with the advent of Skype and other services, which have made videoconferencing mundane, it is hard to imagine what the experience might have been like in 1980. Interviews (see video below) show that people were extremely excited about it, even though some were not completely sure of what was happening, since video-conferencing would not become widespread for at least two decades. Perhaps not surprisingly, young men and women tried to pick each other up! After the first day, when it was not publicly announced, people began to plan to meet friends and loved ones via Hole in Space.